You can use the treadmill whenever you feel like running or walking. Furthermore, some treadmills come with features that simulate different kinds of terrain, making it much more interesting to use them. The best thing is that these machines are not too expensive. In fact, you can easily find best treadmill under 1000 dollars. Millions of people from all over the world are struggling to lose excessive weight. This is a problem that can have much more serious consequences than just making the people look unattractive. Too much body fat can trigger a number of different diseases including heart attack, stroke, and so on. Unfortunately, burning the excessive fat is not easy. Even if you start eating healthy, you might not be able to make your body fit. The only way to do it is by exercising regularly. Jogging seems to be your best solution as this activity burns more than 100 calories in less than 10 minutes. What this means is that you can lose a pound of fat in just a few days if you exercise regularly. However, sometimes the weather conditions won’t let you have your exercise. So, what are you supposed to do if it’s too hot/cold outside to run? You can always have your workout by using a treadmill! If you need help with making the right choice, we’re going to help you. Here are our top 5 picks for the best treadmill under 1000! The Nautilus T614 is probably the best treadmill under 1000 you can find today. It comes equipped with a 2.75 CHP motor and includes no less than 22 workout programs. If you’re looking for comfort that’s exactly what you’re going to get thanks to the StrikeZone cushioning system. Meanwhile, the built-in media shelf allows you to place a book or magazine and enjoy it while you’re working out. The T614 is available at an affordable price and offers a number of very useful features. This treadmill can handle weights of more than 300lbs, making it ideal for anyone regardless of body size. The measurements of the running surface are 20W x 55L and the speed of the belt is adjustable. Running speed can range anywhere between 0 and 12 mph depending on user preference. Similarly, the incline of the belt can be adjusted as well. When you’re done working out, simply fold the T614 so it doesn’t take up too much space. Easily track all the most important stats thanks to the built-in LCD display found on the control panel. The display shows information like calories burned, distance traveled, running speed, and more. Speaking of the control panel, it also features a USB port, speakers, and an adjustable fan. Take advantage of the 22 workout programs to easily plan your next running session. Simply pick one that matches your current experience level and you’re good to go. At the same time, the incorporated heart rate sensor allows you to constantly monitor your pulse. The sensor is built into the handlebars so make sure your hands are placed correctly on the contact grips. It’s pretty difficult to make sure that you get enough exercise in today’s busy world, however, it’s not impossible. For example, treadmill fitness walking is a great option for anyone looking to stay in shape without leaving the house. Sometimes it’s hard to pick between getting on the treadmill and sitting at your computer or reading a book, but now you don’t have. Thanks to the Exerpeutic 2000 treadmill/desk station combo, you can do that and so much more all at once. The great thing about fitness walking is that your mind is free to wander while your body is getting in shape. But with the Exerpeutic 2000, you can keep both your mind and your body busy at the same time. If you fancy a bit of multitasking grab your laptop and browse the internet or get a bit of work done, while doing your exercise routine. You’ve probably heard that taking a little walk can help you get more oxygen to the brain and allow you to focus better on the task at hand. Well, just imagine the levels of productivity you can achieve by replacing the little walk with an actual workout session. It may take a bit of getting used to at first, but you’ll never going to look back once you’re accustomed to this unique training regime. There’s no assembly required for this treadmill so simply take it out of the box and you’re ready to go. The treadmill is meant to work alongside a standing desk so it’s a good idea to have one beforehand. But if you don’t already have one, don’t worry because the LifeSpan TR1200-DT3 works with a large variety of different models and is very easy to attach. It’s just a matter of rolling the treadmill under your desk and then connecting the console and you’re all good to go. The compact treadmill only measures 63″ x 28.5″ x 7.25″ and comes with a very discreet portable console that can be placed on the desk. The console allows you to adjust the belt speed and monitors important stats like distanced traveled, calories burned, step count, and more. All of this useful information is very easy to monitor and keep track of thanks to built-in digital LED display found on the console. The console also comes with a safety key that shuts down the treadmill upon being removed. The maximum speed of the LifeSpan TR1200-DT3 can be adjusted between 0. 4 and 4 MPH. Meanwhile, the 2.25 HP electric motor runs at 2400 rpm and is able to remain very quiet even after several hours of use. 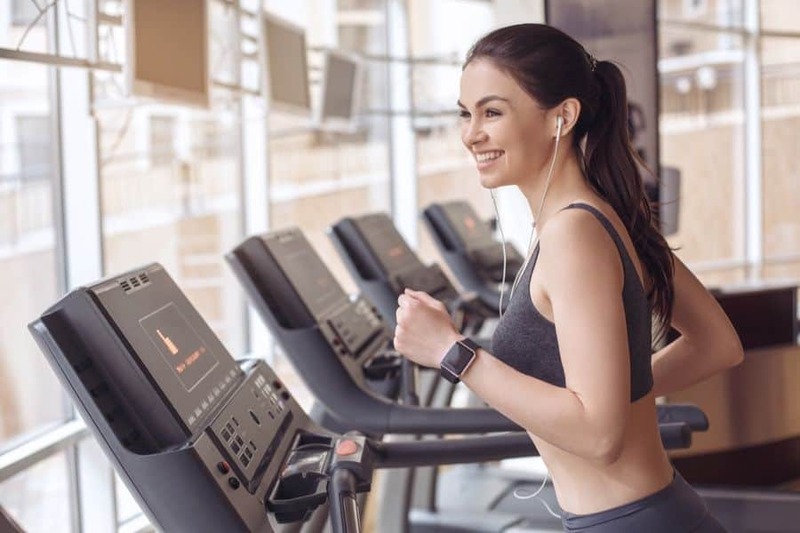 In fact, workplace treadmills like the LifeSpan TR1200-DT3 have been specifically designed for longevity so don’t worry about overly long workout sessions because the belt can definitely take them. The treadmill allows users to change the speed and incline on the fly while they’re working out. The ProForm Performance 400i is perfectly suitable for any level of training ranging from novice to experienced. Intensive workout sessions are not a problem for this treadmill thanks to the 2.5 CHP motor. However, if you’re just starting, the 18 built-in training programs will allow you to take things at your own pace. Meanwhile, you can make sure you never exert yourself by using the incorporated heart rate monitor. Those looking to build up a sweat will be happy to know that the ProForm Performance 400i can accommodate that. The treadmill has a maximum speed of 10 mph, which should be fast enough for most people. The machine is also very energy efficient so you can run all you want without worrying about the electricity bill. Sometimes running indoors can get boring after a while, however, that’s not the case with this treadmill. The ProForm Performance 400i allows you to draw routes using Google Maps and incorporate them into your workouts. The machine will then adjust based on the terrain so you can feel every valley and hill along the way. Treadmills are very useful for those who want to exercise regularly but don’t feel like going to the gym. Sometimes these machines tend to be pretty bulky, however, that’s not the case with the ProForm Performance 600i. In addition, the treadmill also comes with a series of very nice features and an affordable price tag. This treadmill can be folded up and is very easy to store when you’re not using it. This is thanks to the SpaceSaver design, which makes it easy to handle by pretty much anyone. The caveat with most folding treadmills is that they end up sacrificing sturdiness in the process. In the case of the Performance 600i, however, that’s not really an issue as this treadmill is very durable. The ProForm Performance 600i comes with 22 workout programs right off the bat. Whether you’re a beginner or already experienced, you’re sure to find the perfect program for you. As for the price, you’ll be hard-pressed to find a treadmill that offers a better bang for the buck. There you have it – our top 5 picks for the best treadmill under 1000 dollars. Whichever you choose, you can be sure it’s going to serve you very well. Still, which product is the best for you is something that depends on your preferences. You need to think thoroughly how much and where you’re going to use it, before making your final decision. Of course, if you pick one of these 5, you won’t regret it.